Inbee Park of South Korea celebrates after making the final putt to win the 2013 Kraft Nabisco Championship. 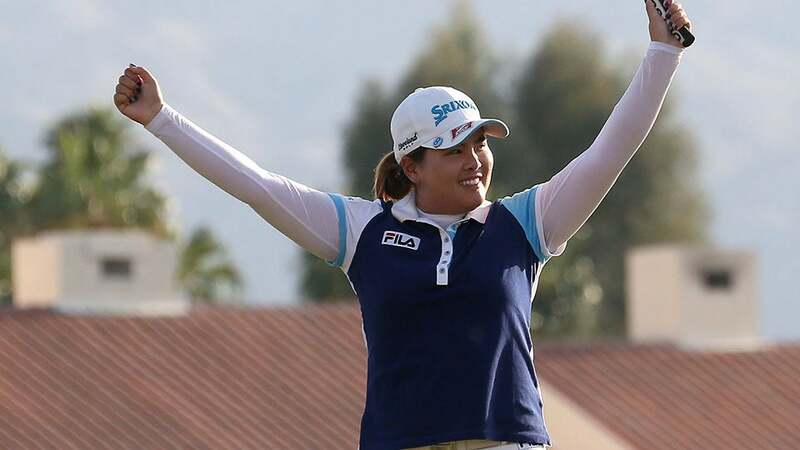 With the completion of her first round at the KPMG Women's PGA Championship at Sahalee on Thursday, Inbee Park, 27, becomes the youngest LPGA player to qualify for that Tour's Hall of Fame. Park achieved the qualification requirements at the end of 2015 when she was awarded the Vare Trophy for lowest scoring average (69.41). Players need 27 points to qualify, awarded based on number of wins, major championships and LPGA trophies. The 27-year-old is the first inductee since fellow South Korean Se Ri Pak in 2007. Park has 17 LPGA Tour wins including seven major championships. In 2013, she became the first player in the modern era to win the first three major events of any golf season, and only one of four players in LPGA history to win three majors in one season. She completed the career grand slam with her 2015 RICOH Women's British Open win, the seventh in LPGA history to do so. Her awards include the Vare Trophy for low scoring average (2012, 2015), LPGA Tour Money Winner (2012, 2013) the 2013 Rolex Player of the Year, and the 2015 Rolex ANNIKA Major Award. Thursday will mark Park's 10th event in her 10th active year on the LPGA. She is the 24th member to be inducted into the Hall of Fame, and her induction will qualify her for the World Golf Hall of Fame, Female Competitor Category when she turns 50 or is removed from active play on tour for at least five years.